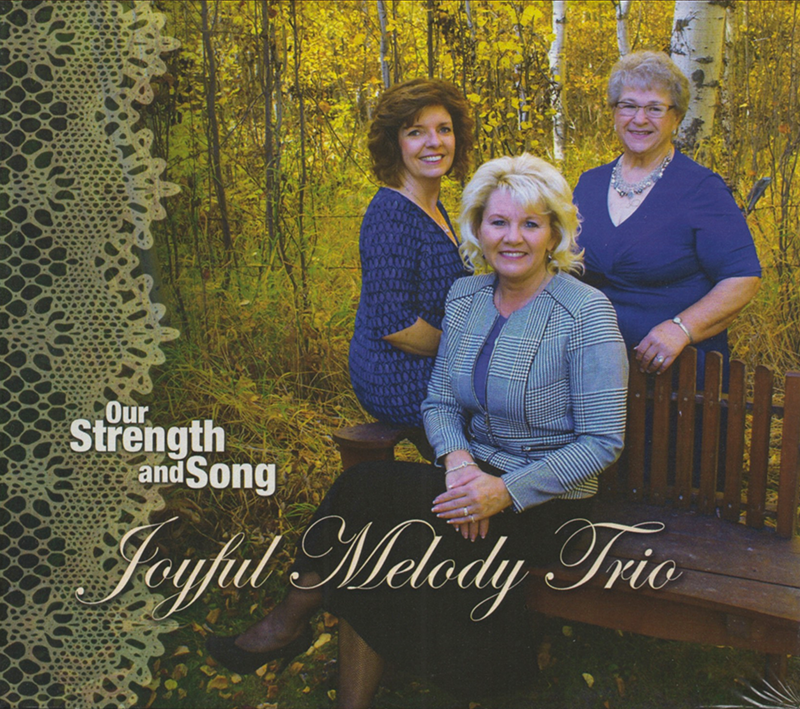 Joyful Melody Trio is one of Alberta’s busiest Southern Gospel music ministries. 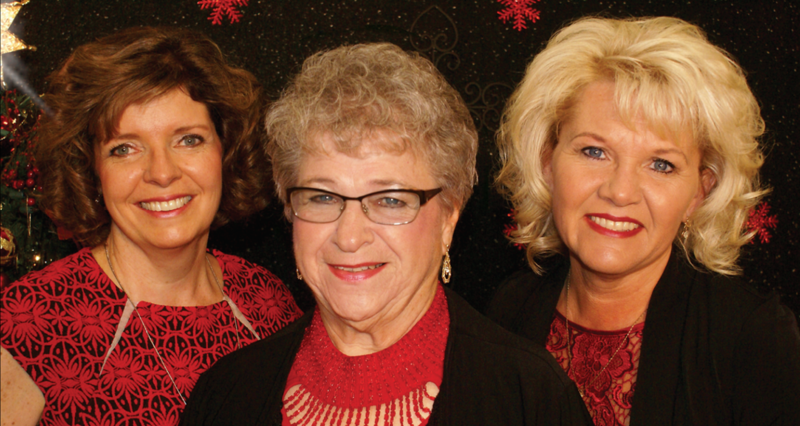 A retired pastors wife and two farmers daughters joined together in word and song since October of 2002. They understand the importance of spreading a commitment of excellence and clear communication of the Gospel in word and song. This has become a defining characteristic as they encourage and lead their audiences to reach out and touch Jesus. They strive to ensure words are clearly heard and understood with the Gospel message. Their message is toured extensively across Western and Central Canada, extending into the Northern USA. This music ministry reaches hundreds through concerts from church platforms to other venue stages; from charity organizations to prison chapels; singing to groups of all sizes, all ages, any day of the year. 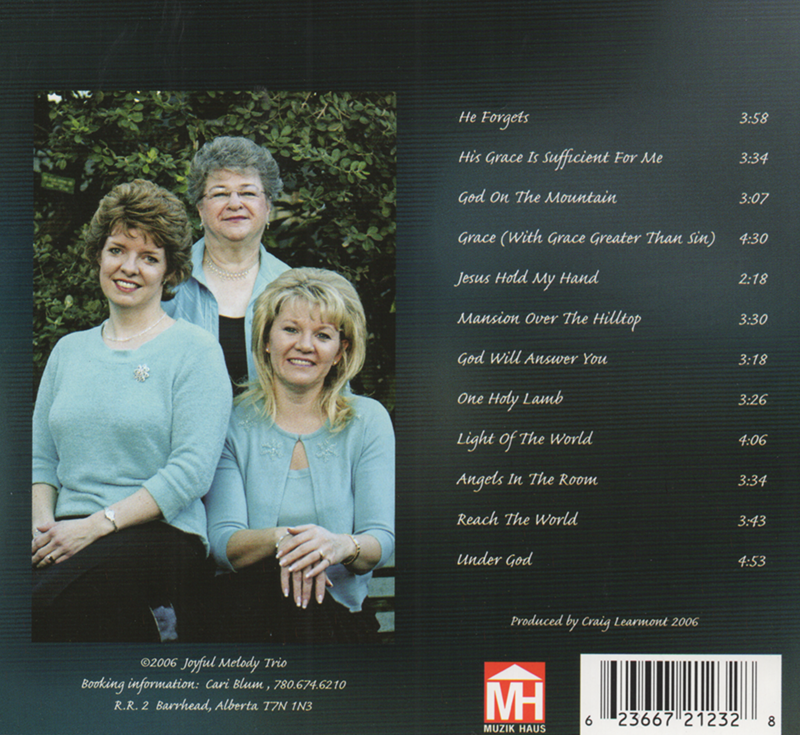 These ladies are just normal people, with normal families dedicated to God and family. Joyce’s personal testimony (highly demanded) deals with family issues regarding drug and alcohol addictions and grandparents raising grandchildren. She shares a touching reflection of true life experience, which is wrapped in song and followed through with life applications. Her story seldom leaves a dry eye in the house as the audience connects. The power of prayer and God’s faithfulness is evident. This topic is often avoided, yet we (God’s people, the church) need to talk about it because support and prayer can be found in our home churches. God has faithfully responded to Joyce’s prayers. Through all the hardship, God has given her a forum to share that God still performs miracles today and illustrates how prayer can change lives and circumstances. The combination of story and song will leave your toes tapping and your heart rejoicing. Women’s ministries and conference topics include Joyce’s testimony plus “Designed By God for the Seasons of Life”, which are designed for single or multiple day application. They partner regularly with RSVP Ministries, the Gideon Organization, Wycliffe, Cowboy Churches and Rodeo Ministries, fund-raising events and campaigns, adults with disabilities, gospel jamborees, senior functions and facilities, and pulpit ministries for different denominations. 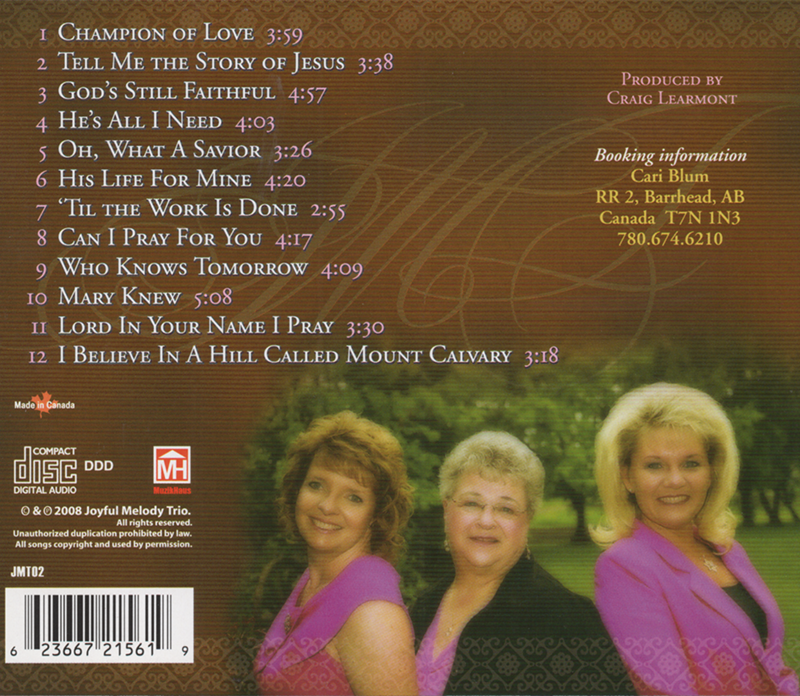 The Trio has been blessed to produce multiple studio recordings, including classic southern gospel, hymns, original songs and arrangements, which affirm their commitment to this calling. 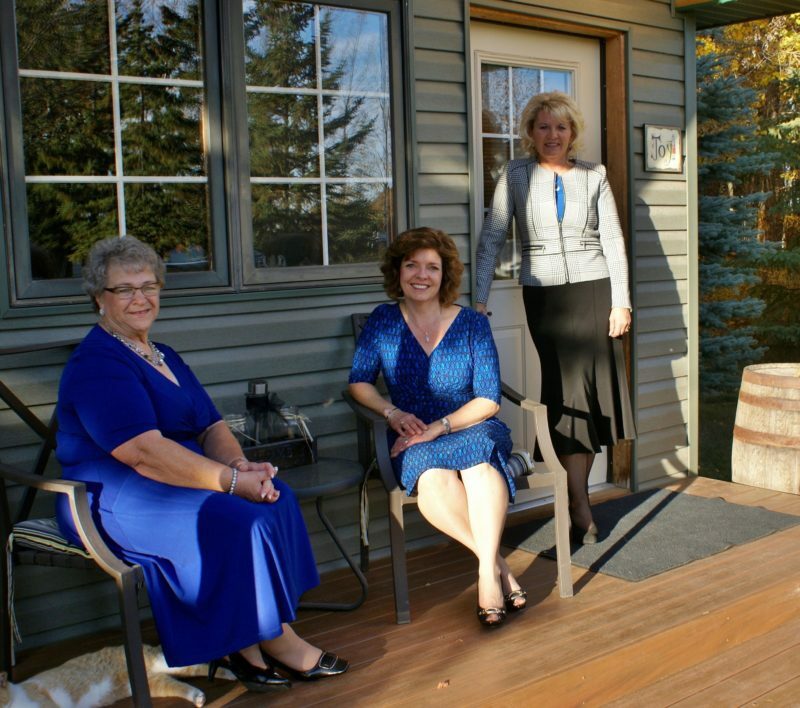 Colleen grew up on a dairy farm in Barrhead County and now makes Morinville, Alberta her home. Colleen has always had a passion for music. She started singing duets with her sister accompanied by their mother on the piano. Her musical interests began with piano lessons, playing instruments in the school band program, plus singing and playing in the church. 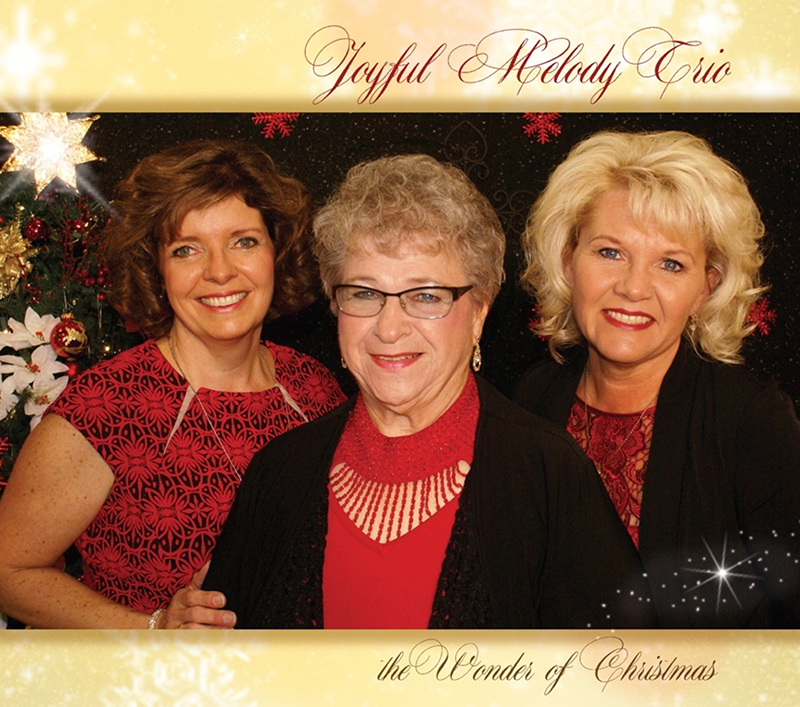 She joined the Joyful Melody Trio in the fall of 2002, and her musical journey continues with the love and support of her husband, Daniel, and their two children. 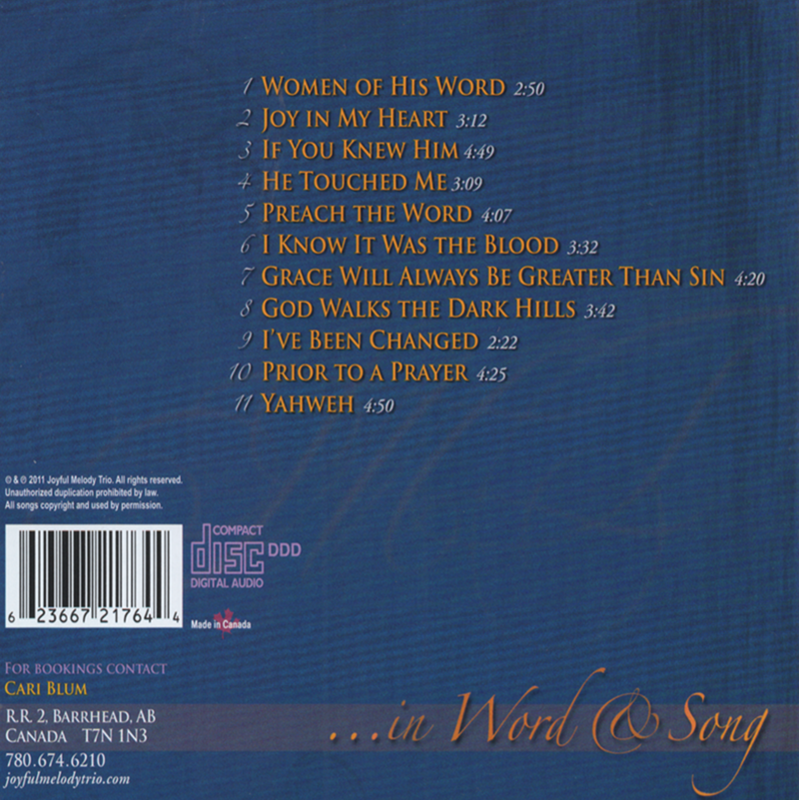 Colleen is fascinated by how God works miraculously through music, as a universal tool to open a vast array of emotions that speak to our hearts and minds. Her scripture to live by is Proverbs 3:5-6. 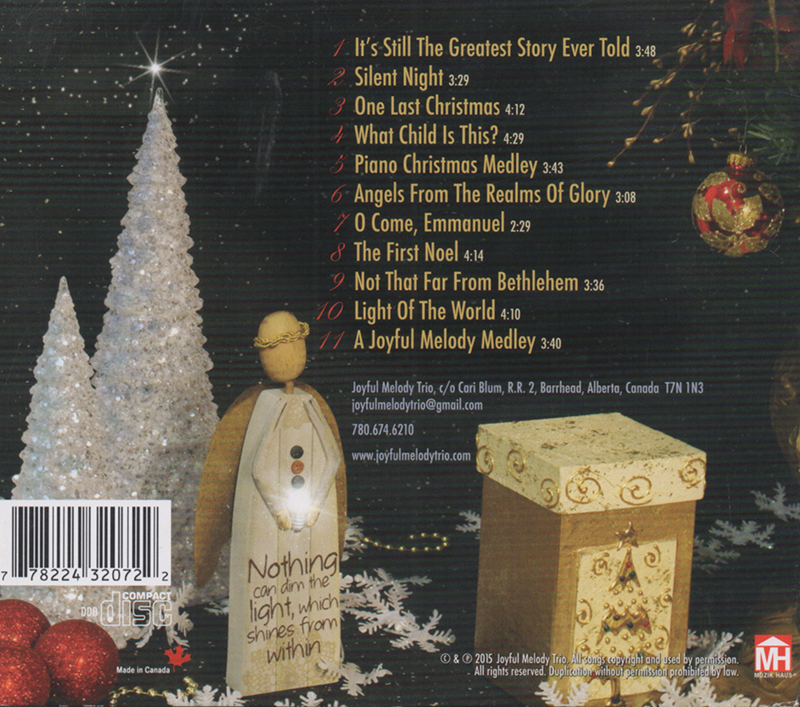 We believe the wonder of Christmas proves that God is a promise keeping God. God said he would send a Deliverer… and He did. Matthew 1:21. No wonder Christmas is the “Season of Joy”. May the presence and power of God, the joy and wonder, His blessings and His love; the Promise of Christmas be yours through the years to come. A wonder-filled life is yours, when you know the Christ of Christmas. Music has the power to motivate, encourage and inspire people as it lifts our spirits by reminding us of God’s faithfulness. 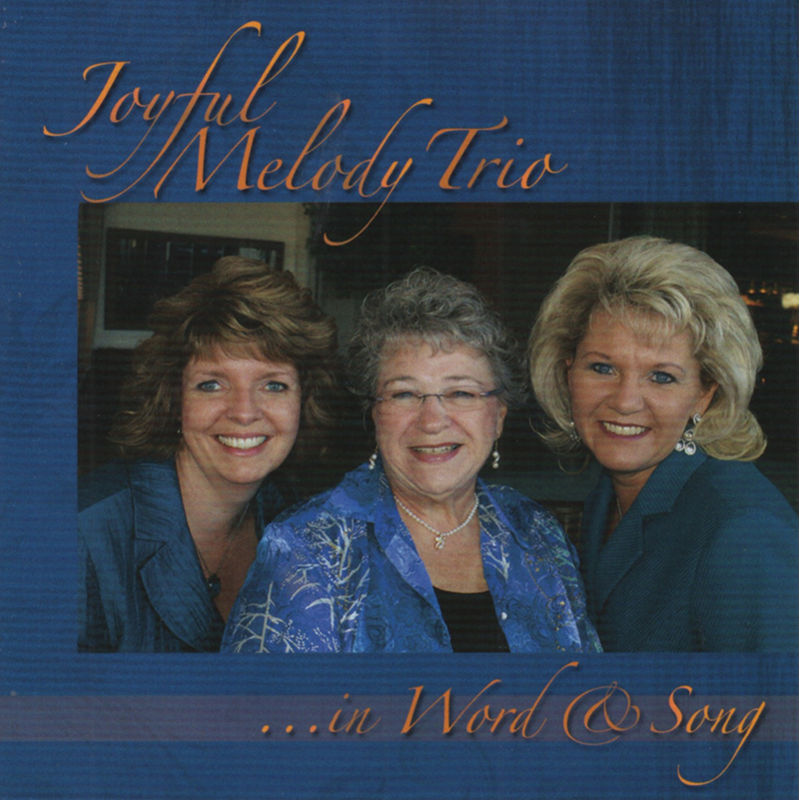 We have unwaveringly felt His strength and joyfully sing songs that celebrate God’s help in our times of need. Join us as we sing songs and hymns of joy, which raise our eyes from challenging circumstances, allowing us to face victory and see the power and breathtaking presence of the Lord. We are reminded daily – He is our strength, our song and our salvation. May we always strive to give all of our heart, soul, mind and strength to following Jesus Christ! 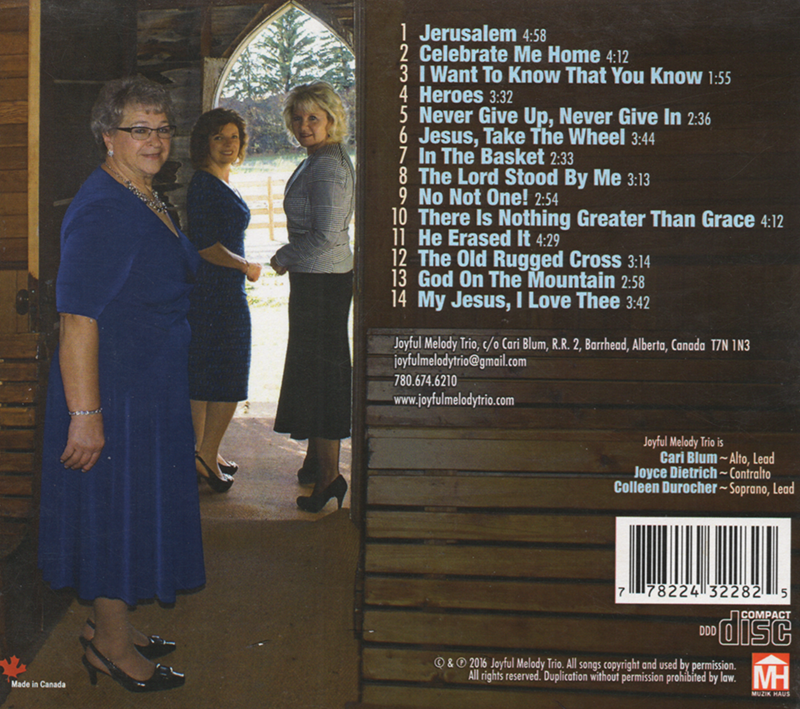 Isaiah 12:2, our hymn of praise, “I will trust and not be afraid, for the Lord Jehovah is my strength and my song”. 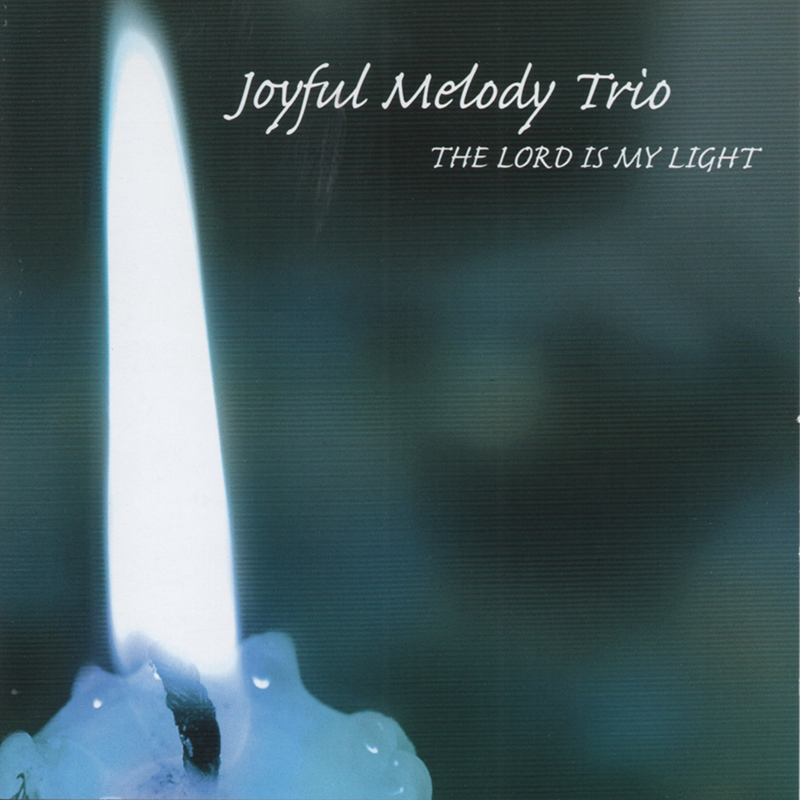 “Joy, joy, joy!” May you experience resurrection deep inside and the joy that only Christ can give as you reflect over the words of the songs on this recording. 1 Corinthians 15 ties this entire project together beautifully. Salvation is a wonderful gift. Forgiveness and eternal life come to us only by grace and through faith in Christ. “God saved you by His grace when you believed. And you can’t take credit for this; it is a gift from God. Salvation is not a reward for the good things we have done, so none of us can boast about it. For we are God’s masterpiece. He has created us anew in Christ Jesus, so we can do the good things He planned for us long ago.” I have New Life, for that, I choose to rejoice today! The secret to abundant life is a close relationship with God as we follow the truths of Scripture. Seeing God in the Bible requires a willingness to do the will of God. Only in surrender do we have assurance that God will let us see the truth about Christ in our present circumstances. Read 1 Thessalonians 4:13-18. Hide His word in your heart. May God richly bless you. Lord, we look to You each day for everything we need; direction, wisdom and hope. Thank you for your continued faithfulness as you answer our prayers and grant our hearts’ desires as we promise to fulfill Your purpose. May He answer all your prayers! Lord, let us not “limit” our prayers. Help us to ask big, pray big, because Your word promises power through prayer. As you pray fervently and faithfully, you will experience many astounding and affirmative answers. So Pray On! 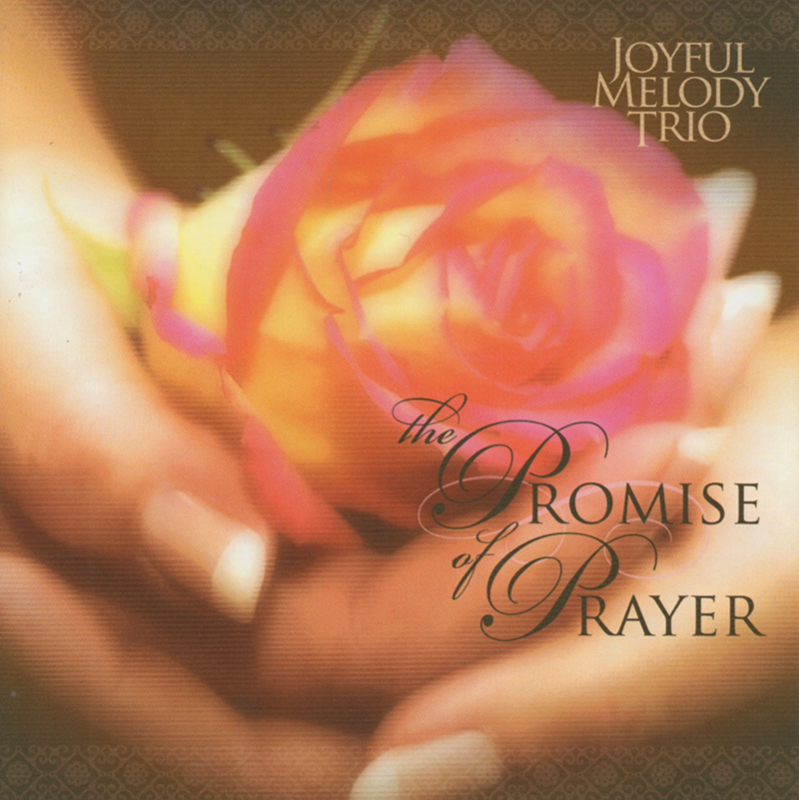 May you embrace the power of prayer and always carry the promises of God in your heart. God has called us into a world of darkness to be light. He has called us to make a difference and change the world for the better. Help us Lord to be a light as we strive to be a mirror image of You.